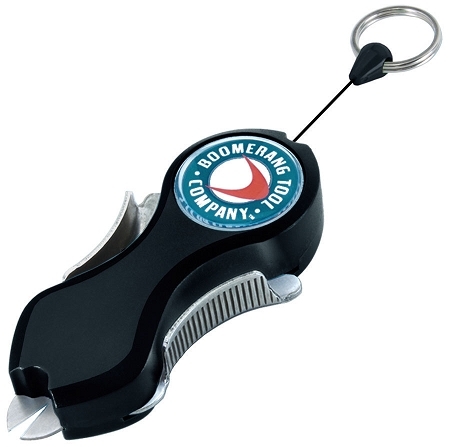 Boomerang Retractable line snip clean cut mono and braided line (50-lb test) quickly and easily. These snips are indispensable for any angler, weekender to pro. These amazing line cutters cut 50lb braid like butter!! and is priced to fit any angler’s budget. The Snip offers anglers an effective alternative to awkward, easily misplaced cutting tools like scissors or nail clippers. Compact, lightweight, yet extremely durable, it features precise, corrosion-resistant “Grade 420” stainless steel blades that slice through monofilament, fluorocarbon, and even braid, like butter. This unique tool delivers more than a clean, smooth cut every time. The Snip offers a level of convenience and ease-of-use that other line-cutting tools can’t match. This patent-pending, spring-loaded retractable “leash” allows The Snip to be attached anywhere on your boat—or on your person—and extend a full 36? for duty. You’ll never have to search around for your cutting tool again, and since The Snip is always secured, there’s no chance of losing it overboard.